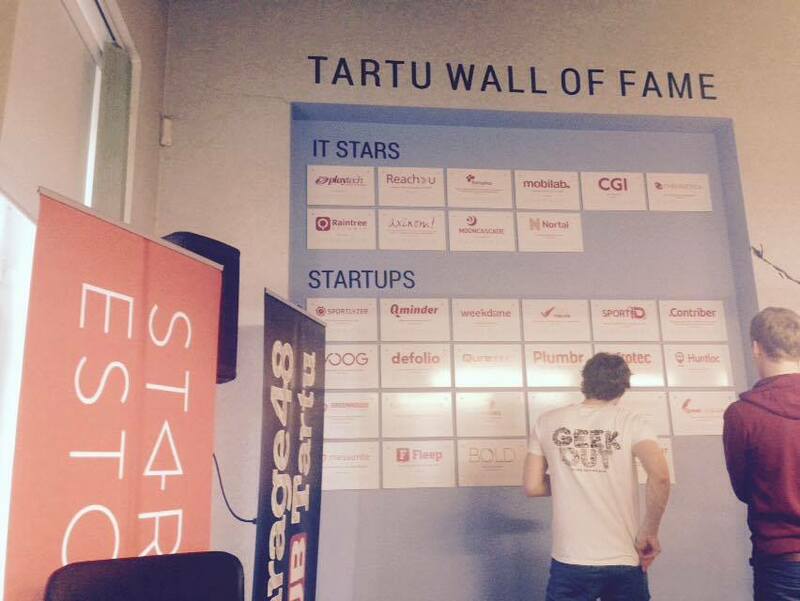 Startup Estonia had its monthly community meetup and this time at the Garage48 HUB in Tartu - for the first time! Excited much? Yes! So were we because we had three awesome guys from Taxify, Fortumo and SprayPrinter join us sharing their experiences with marketing their startups and around 50 people gathered to listen to them. What did we learn from them? Do read further! The first speaker, Mattias Liivak from Fortumo, talked about the importance of content marketing. Why have they chosen this kind of approach one might ask. Since Fortumo is all about selling trust, they need to be sure that people see them as the industry expert and what better way of showing it than creating their own original content based on their product. Mattias said that since they collect data anyway, they might as well use it in their marketing as well. Fortumo creates the content and if interested people would want to get access to that info, they need to leave their e-mails, creating potential leads for the sales team. But it also works vice versa – the sales team gives insights about feedback and most common questions via content marketing before the questions can even arise for the new or potential users. What kind of content is created and where do the ideas come from? Fortumo uses their data to create all sorts of market reports and people who are searching for them are most likely the potential clients. They also share what they have learned when it comes to entering new markets and launching an app in the specific niches important to their clients. Being open about mistakes is another approach and basis Fortumo has for creating its content. Of course, creating profound content is one thing, but distribution is just as important. All blog posts are SEO optimised, shared in social media and communicated via newsletters. Mattias brought out that Slideshare is one channel that is often underestimated but in Fortumo’s case it works well. What other tools are in use at Fortumo's marketing? When Fortumo joked about being a “young” startup of 9 years then SprayPrinter really is a very new startup. Since they are only six months old, they talked about what they have learned so far as the journey from the very start to the current product had not been very easy. It was only the third time that SprayPrinter got into BuildIt hardware accelerator, which they consider to be the most important day in the life of their startup so far! SprayPrinter started with zero money which means that investors were needed and rather fast. Investors were interested but they wanted to see traction and interested customers. To prove their point, SprayPrinter wrote an article about their product to Designboom, which in the next 48 hours pretty much exploded and was cited on over 30 other blogs and news sites. That was the moment when the team realised their product was all about marketing. From that one article many other articles grew out and when it was time for Indiegogo campaign, everything about SprayPrinter was already published. Lesson learned here: Get your timing right! It was a lot harder to get the media’s attention the second time when we needed it even more. Luckily, SprayPrinter got their first investor. But they soon realised, there was no point being in this alone. Again, luckily potential partners were interested and now they are cooperating with Bosch and Montana who are the top notch companies in their field. Who has NOT heard about Taxify? Henrik Raave introduced the fast growing taxi app called Taxify. The service is already used in 10 countries, among others are Serbia and Mexico for example. Most of the marketing is done by their clients – around 70% of marketing is word of mouth and another 15% through referrals, meaning current clients giving out free rides to their friends who are not already using the app. Henrik believes that if people don’t share your product, it is not good enough. Marketing tip: Give people a reason to TALK about you! This is exactly what Taxify is doing – they suggest that well-known people use their app which would also give the celebrity a chance to talk about their doings and meanwhile introduce the Taxify app as well. For example, Taxify has collaborated with Jan Uuspõld and Curly Strings among many other public figures. TIP: Taxify uses intercom.eu for customer leads! This tool gives them nice insight about mentions and mentions give an opportunity to speak along on the topic and always give their own comments when appropriate, whether online discussions or newspaper articles. How well do you know your fellow startups?